The Rotary Club meeting for March 19 started off with President Nancy Fusco announcing services for long-time Rotarian Rich Besselman. Fusco passed around a photo album from 1994 which is believed to be from John Sawyer’s year as Rotary president. In 1993 Rich Besselman was president of the club and there are many pictures of Rich in the album as well as many of our club members looking a lot younger. President Fusco said, "Rich was loved dearly and will be missed by the club." Jerry Regan announced that there is still time to declare tax deductions for 2017 and referred to the article in the March 16 Herald/Review that listed organizations you could contribute to and take advantage of the tax credit. He also encouraged all to do their civic duty and vote for board members of SSVEC. Karina Rice-Roberts provided an update on the opportunity to tour the bus stop covers we provided for Agua Prieta bus stops. The now covered bus stops will protect children and others from the harsh elements while waiting for the bus. The trip to Agua Prieta will be on April 14. The bus will pick attendees up at 10 a.m. at Pueblo del Sol Country Club and return around 6 p.m. The day will be filled with shopping, the tour and finish with a BBQ and fellowship at the Agua Prieta Rotary club house. It is $25 per person for those leaving PDS and $10 per person for those boarding in Douglas. This event is replacing the family picnic and is a family friendly event. Agua Prieta Rotary is excited to host us for the day. 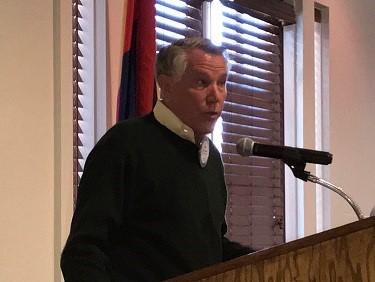 Rick Coffman of Castle & Cooke presented on water and water issues and how they impact Castle & Cooke activities as well as other development activities in the area. Coffman, a graduate of Columbia and Harvard, a self-proclaimed conservative, has been in Sierra Vista for the past 15-years. Coffman provided an overview of two key legal issues that impact further development. The first issue is the Tribute lawsuit specifically on adequate water supply. The second issue deals with general adjudication of the Gila River that has been going on since 1985. During Coffman’s detailed overview he urged the group to keep an eye on the general adjudication and the Bureau of Land Management. What happens with the legal issues could impact all our home values and the community.